A whopping 90% of employees are “open to new opportunities,” according to a LinkedIn survey. In other words,they’ll jump ship and join your crew for the right offer. And “the right offer” is just a nice way of saying a bunch of money, right? Well, according to Gallup’s just-released State of the American Workplace report (and LinkedIn’s own data), that’s not quite true. The single most important thing for employees considering a new job isn’t income, it’s “the ability to do what they do best” in a role. This is just a small glimpse of the Gallup report—a 212 page in-depth study on employee attraction, retention, and engagement (this is an update of their often-cited 2013 report). The report is full of intriguing insights and is worth your time if you have a spare hour or two to browse through it. However, if you don’t have the time, we have pulled out the top three takeaways for recruiters, highlighting what’s most important to candidates considering a new job and what talent acquisition professionals can do better. Let’s dive in. You might have more recruiting success if you appeal to candidate’s desires for self-fulfillment. 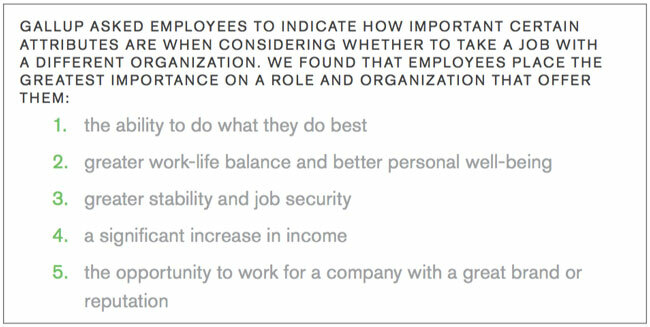 Most employees—60%—say “the ability to do what they do best” is “very important” when considering a new job at a new organization. That sounds sort of obscure, though, doesn’t it? Put simply, employees want to be in a position where they can reach their full potential and realize the height of their powers. Surprisingly, this tops all the other criteria offered, including “greater work-life balance and better personal well-being” (which 53% considered very important), “greater stability and job security” (51%), and even “a significant increase in income” (41%). Takeaway: Make it clear to candidates that you value their strengths, and that they’ll be in a position where they can exercise, develop, and master those skills. 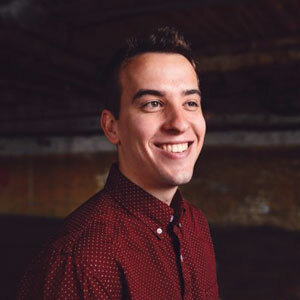 Whether you see that tendency as a lack of loyalty or admirable ambition, recruiters should know what particularly appeals to millennials: the freedom and flexibility to work when and where they’d like. While 51% of employees would change jobs to have flextime (and only 44% say their current company offers it), you get a starker picture when you filter by age. 63% of millennials would switch jobs for flextime, while only 47% of baby boomers and Gen Xers feel the same. That means millennials are 37% more likely to see flextime as a reason to jump ship. 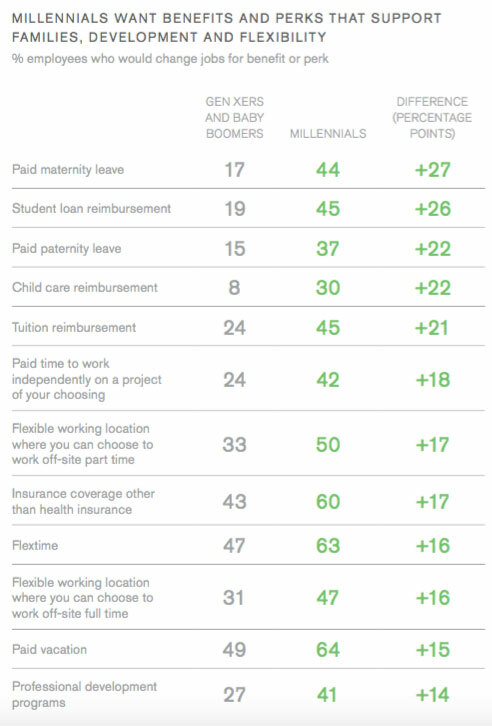 Similarly, 50% millennials would join a new company for a “flexible working location where you can choose to work off-site part time,” yet only 33% of older cohorts share that sentiment. That means if you’re trying to poach someone born after 1980, they’re over 50% more likely to be persuaded by a part-time flex-location perk than their older counterpart. Takeaway: Emphasize flexible hours and workplaces when recruiting millennials—and if you don’t currently offer it, talk to HR about how you can start. As a recruiter, you’re always looking for the most effective way to reach potential candidates—whether that’s job postings, networking events, or referrals. 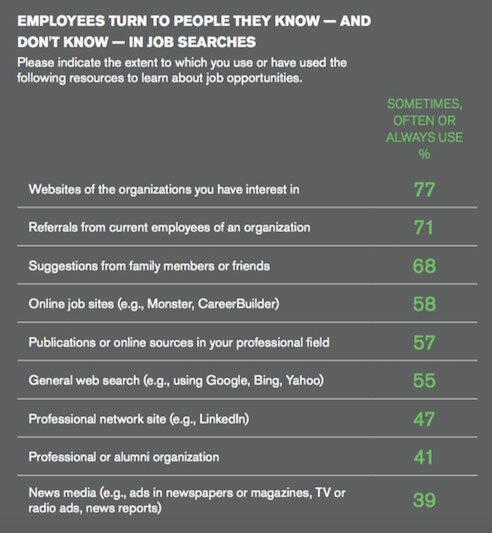 The question is: which resources do employees actually use to learn about job opportunities? Gallup has the answer. The most commonly used resource wasn’t job sites, as some might expect—it was a company’s website. This implies that employees already know where they want to go next: instead of casting a wide net and trawling for any opportunity that comes their way, more candidates are searching for specific jobs at companies they admire. It also means that you shouldn’t ignore your web presence: make sure it’s easy for interested candidates to find the info they need and apply online through your site. Referrals are the most popular source after websites, so if you don’t already have an employee referral program, you might want to show your boss this stat and get them to incentivize successful referrals. After websites and referrals, suggestions from friends and family is the most resource—and this is where your employer brand really shines. Companies often find that their reputation precedes them, and a candidate's inner circle can wield a great deal of influence: if you’re known to work people to the bone, you’re less likely to get a suggestion; inversely, if everyone knows your company treats people right, friends and family will encourage a candidate to take the job. Takeaway: Don’t neglect your online presence, incentivize employees with a referral program, and elevate your employer brand. These insights are just the tip of the iceberg from the Gallup’s impressive new report, but they’re also the most valuable to recruiters. With 90% of employees open to the right offer, you can use these revelations to craft the perfect pitch—and poach that purple squirrel.